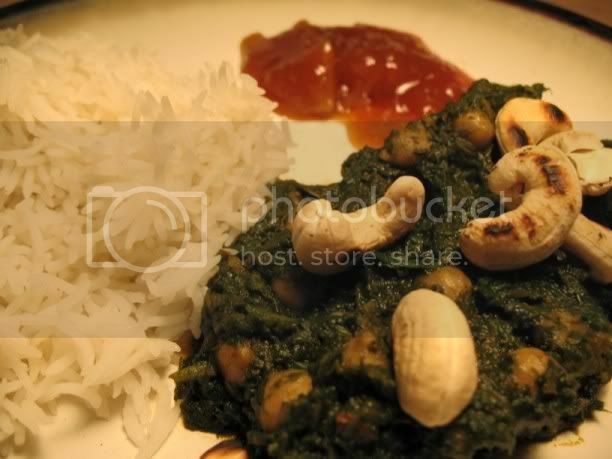 Palak Chole (puh-lack cho-lay) is one of my favourite meals to eat at Indian restaurants. While I am terrible with the names of everything, I do know what I like! Palak Chole is spinach and chickpeas, respectively. 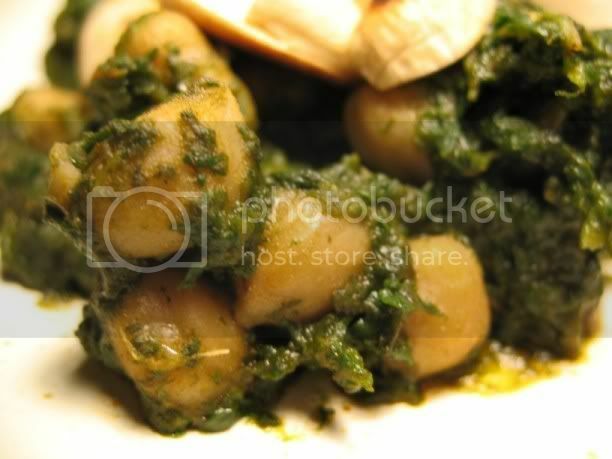 Tender chickpeas and spiced, smooth spinach sauce. This recipe is from Vegsource.com. Served with chutney and Papadum (crispy spiced cracker-like bread) I bought at the Indian Market. 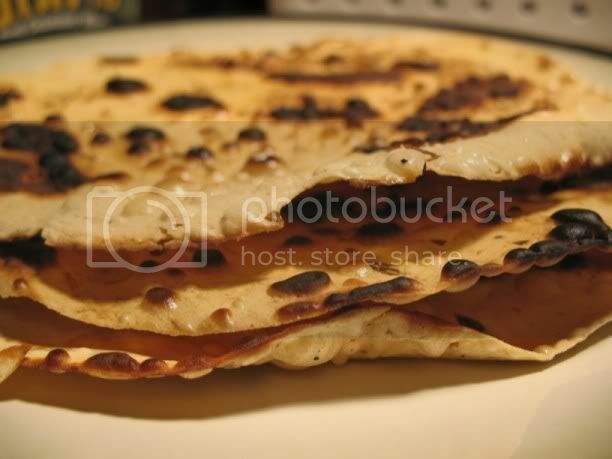 I sauteed papadum in a skillet with some oil as opposed to deep frying it. I am altering it because it was way too spicy for me. Also, ***I would suggest using 2 packages of (10 oz)frozen spinach, thawed and squeezed well. I started with one 10-oz. bag of spinach and it made maybe 1/2 cup puree. If you use frozen spinach, do not cook as it is already cooked. Just squeeze well and puree. Wash and soak chickpeas in 4-5 cups of water for 5-6 hours. Drain, add 3 cups of fresh water and pressure-cook till done. Note: I didn't soak, just pressure cooked until tender. Spinach: Remove stalks, wash and blanch spinach in boiling water for 2 minutes. Drain, refresh and blend to a puree. Remove stems and wash green chillies. Peel and wash ginger and garlic. Grind the three to a coarse paste using a little water. Heat margarine in a pot, add cumin seed and sauté till it changes colour. Add green chilli-ginger-garlic paste and fry for a minute. Add tomato puree, red chilli powder, garam masala powder and salt and fry for a few minutes or till the ghee leaves the masala.Add spinach puree and chickpeas and stir gently. Cover and allow to simmer on low heat for five to six minutes.Serve hot.